Workplace accidents can happen anytime to any type of worker. You do can everything in your power to avoid them, but just like any life occurrence, anything can happen. Accidents happen every day, in fact, and in every industry. That’s just how it is. If you think just because your business doesn’t involve heavy machinery or super-sharp things that you’re in the clear, you’re wrong. In 2017, there were 2.8 million non-fatal workplace injuries, and private industry employers reported illnesses across all sorts of different professions. The good news is that this is exactly why workers’ compensation insurance was created, to help employees recover from injuries sustained in the workplace. And to help you fully understand everything your business needs to know on the topic, we brought in our dear friend, and insurance know-it-all, Paul Martin. So, let’s jump in! For one thing, it’s mandatory—well, kind of. Every state in the United States, except for Texas, requires workers’ compensation coverage from its employers. However, each state does have different requirements and minimum coverages. Now, just because it’s mandatory in nearly every state doesn’t mean they’re going to push you until you purchase it. In fact, the state won’t really know whether you have workers’ compensation, so getting the right coverage is all on you. But just know that if you don’t have coverage and an employee gets injured on the job, you’re opening yourself up to some serious lawsuits from the employee AND the state. As we’ve already established, accidents happen. That’s just life. And to help you understand more about how and why they happen, we’ve compiled a list of the top ten most common workers’ compensation injuries filed each year in the US. Overexertion happens when someone bites off a bit more than their body’s muscles can chew. Big lifts, pulls, pushes or throws can injure a muscle or force a joint beyond its usual range of motion. This is most commonly seen in factory jobs, construction jobs, and jobs where physical labor is necessary. The majority of all slip, trip, and fall claims happen when employees slip on wet floors or snowy walkways. Security workers, groundskeepers, and store clerks are among those who most commonly fall victim to freshly mopped floors and big ol’ wet spills. A high voltage electric shock can do more to the body than make your hair stand straight up. Electrocution can result in severe burns, cardiac arrest, organ damage, nerve damage, and even brain injury. 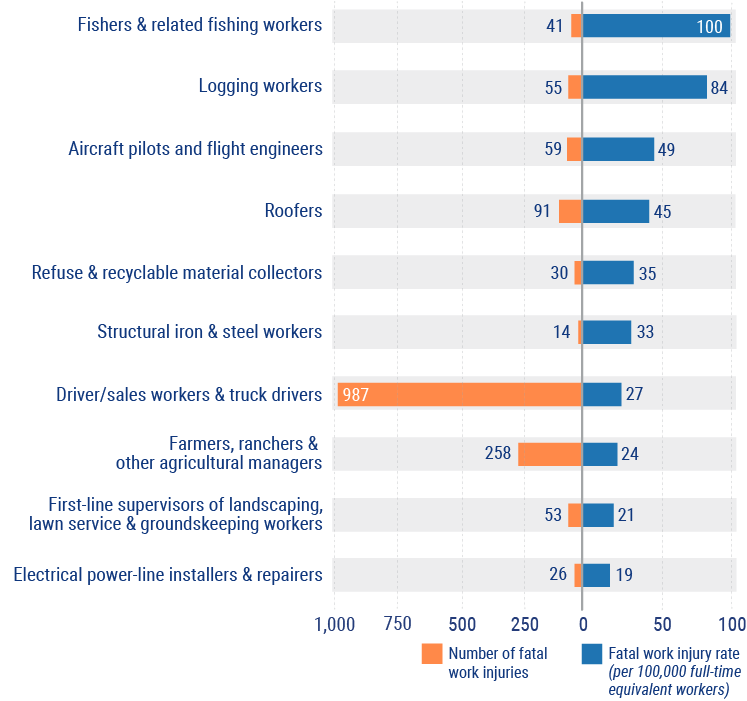 The most common victims of electrocution include electricians, crane operators, forestry workers, construction workers, truck drivers, utility workers, and carpenters. While very plain, this injury occurs most commonly when something falls off a shelf, or things are dropped by another worker onto a lower level. Office workers, along with restaurant and retail workers, are all in danger of being struck by something. Workers can also be physically forced into something such as a bookshelf, barricade, or other stationary object. Especially in the case of truck drivers, one of the top causes of injury is accidents while driving (for business purposes) on roadways. This is also a common occurrence for traveling business representatives and police officers. Machinery accidents are typically reported in cases where large, heavy machinery has injured workers by crushing or mutilation. Most commonly seen in factories or at construction sites, these accidents can be followed by huge medical costs. Many states have enacted laws that require training for employees before allowing them to operate equipment, along with maintenance requirements for machinery to keep it in safe working order. Keeping employees up-to-speed on equipment, along with keeping that equipment maintained, are two important factors in protecting employees from injury and avoiding all that comes with it. According to the Bureau of Labor Statistics, unintentional overdoses due to non-medical use of drugs or alcohol while at work increased 25%, going from 217 in 2016 to 272 in 2017. This was the fifth consecutive year in which unintentional workplace overdose deaths increased by at least 25%. Nearly 2 million American workers experience workplace violence each year. According to OSHA, health care and social service workers such as visiting nurses, psychiatric evaluators, and probation officers; community workers such as gas and water utility employees, phone and cable TV installers, and letter carriers; retail workers; and taxi drivers are all at higher risk to experience workplace violence. Chemical exposure occurs when the body is exposed to dangerous chemicals like asbestos, lead, benzene, pesticides, cadmium, beryllium, mercury, silica, paint, solvents, and acids. Injuries due to exposure to certain harmful chemicals can include burns, rashes, throat and lung injuries, and even more dangerous consequences like neurological injuries. Employers who put employees at risk of chemical exposure should require proper safety attire including goggles, gloves, helmets, body suits, and having proper means of ventilation. 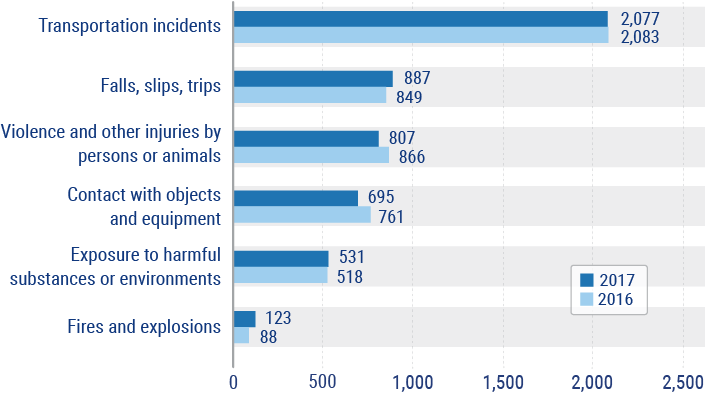 A recent survey conducted by the Allianz Global Corporate & Specialty (AGCS) organization found that fires and explosions caused more than $15.9 billion in losses to businesses. Exposure to fires and explosions can result in inhalation issues, loss of hearing or sight, lung damage, brain injuries, shock wave injuries, respiratory or cardiac arrest, and wrongful death. Where there’s a need for workers’ comp, coverage is available. And the need is everywhere. As an employer, you can go to a company that directly sells insurance to the public, or you can contact an independent insurance agent. Some states have what are called markets of last resort. In Arizona, California, Colorado, Hawaii, Idaho, Kentucky, Louisiana, Maine, Maryland, Minnesota, Missouri, Montana, New Mexico, New York, Oklahoma, Oregon, Pennsylvania, Rhode Island, Texas and Utah, employers can choose to get coverage from the state without going through an agent or third-party insurance company. There are also five states in which insurance companies don’t sell workers’ compensation insurance at all; North Dakota, Ohio, West Virginia, Washington, and Wyoming all require that you buy directly from the state. When it comes to the costs of workers’ compensation insurance, it all depends on the industry and the number of employees. Every business is classified based on their operations, and that classification determines the rate that they’ll pay. Then employers are charged the rate they’ve been assigned per every $100 of their payroll. Rates are based on a variety of things, like potential risks, past safety risks, and location. That means that two different roofing contractors in California can have totally different rates. If an employee gets injured, how and when to file a claim is all driven by the laws in your state. Generally, state laws say that if you have an employee who suffered an accident on the job that resulted in injury, you must report the injury within 30 days. Once the claim is filed, the employer is not part of the payout. The insurance company will pay any medical bills and lost wages associated with the injury until the employee is able to return to work again. If an employee is injured to the extent that they can’t return to work, then the insurance will pay the employee for the remainder of their life. The easiest way to avoid injuries in the workplace is to create a safe environment for yourself and your employees. If an employee does get injured on the job, be sure to report it right away. Workers’ compensation is meant to benefit employees AND employers, so don’t be afraid to let this insurance do its job. The price of workers' compensation varies among industries and job types; contact a local insurance agent to find a policy that is best for you.